SaaS M&A has picked up sharply in 2016, with MSFT (LNKD), ORCL (N, OPWR, TXTR), CRM (DWRE) and even VZ (FLTX) each making billions of $ in acquisitions, with other potential strategic buyers – IBM, HPE, SAP, ADBE, AMZN, and GOOGL – thought to be in the market. We believe that this is the start of a long term shake-out, with large firms levering significant scale synergies in consolidating smaller applications that add sales growth and fill horizontal or vertical holes in their SaaS strategies. SaaS prices have not fully recovered from a 1Q16 swoon that leaves valuations historically attractive, attracting financial buyers to market – QLIK, MKTO, CVT and SQI were taken private for substantial premiums. For their part, substantial R&D, sales and infrastructure investment scale disadvantages that are becoming more apparent as the big players bulk up may have even larger SaaS companies open to selling. We see many companies in the sector – e.g. PEGA, NOW, WDAY, ULTI, CSOD, HUBS, ZEN, NEWR, SPLK, DATA, MDSO, SHOP, QTWO, PFPT, CYBR, IMPV, and others – as targets, and thus opportunities for investors. AMZN or GOOGL could even consider a mega-deal for CRM to gain its well-regarded enterprise sales organization and instant relevancy in SaaS applications, while MSFT likely retains its interest in consolidating the company. SaaS M&A has accelerated. 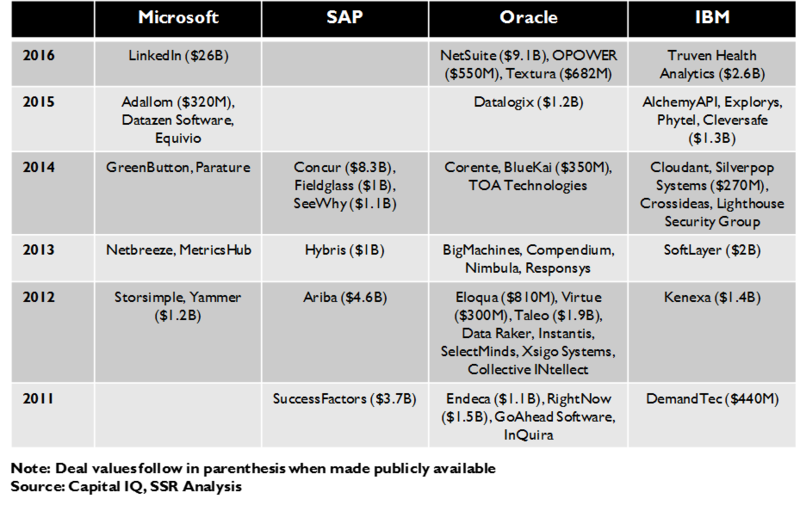 Year to date, 12 public SaaS companies have been acquired, led by MSFT’s $26B purchase of LNKD. ORCL dropped $9.3B on N, adding it to the $1.2B it spent on OPWR and TXTR. CRM paid $2.8B for DWRE, along with an estimated $1.2B for a handful of private SaaS companies. Even Verizon joined the game with its $2.4B deal for FLTX. At the same time, private equity investors have also targeted public SaaS companies, taking QLIK, MKTO, CVT and SQI private this year. By comparison, just 6 public SaaS players were acquired for all of 2015. Valuations still off of 2015 peaks. SaaS names dropped precipitously in Feb. after 4Q disappointments from LNKD and DATA. While most have subsequently rallied back to approach their 52 week highs, very strong YoY growth leaves sales multiples somewhat depressed. Our list of 16 SaaS targets delivered 38.2% aggregate YoY growth, with the average trailing P/S falling from 11.2x to 9.0x. With strong prospects of continued growth for proven SaaS franchises in the midst of a major enterprise paradigm shift to the cloud, we believe that these companies remain attractive targets for financial buyers. Synergies abound for strategic buyers. Most smaller SaaS companies remain marginally profitable at best, with substantial capex commitments further weighing on free cash flow. Combinations with cloud platform players offer substantial economies of scale from leveraging hyperscale data center operations. Moreover, selling costs, which can top 75% of sales for a company the size of CSOD or NEWR, can be dramatically lower tucked into a larger organization, like CRM which spends 59% of revenues on sales while reaching a much broader set of accounts. Finally, products may fill holes or add new functionality that improve the acquirer’s own value proposition to its customers. 3 categories of SaaS targets. We see SaaS buyers as likely to focus on 4 types of companies to fill holes in their own broader suite of cloud applications. 1. Business process solutions – like HR, customer service, marketing or CRM. We see PEGA, NOW, WDAY, ULTI, HUBS and ZEN in this category. 2. Vertical solutions for specific industries – e.g. VEEV, SHOP, RS, and QTWO. 3. Tools – software functions that can be applied across a business, such as security (CYBR, PFPT, IMPV) or business analytics (NEWR, SPLK, and DATA). To date, we have seen deals in all 3 categories, and the 41 public SaaS companies with better than $1B market cap are spread fairly evenly. 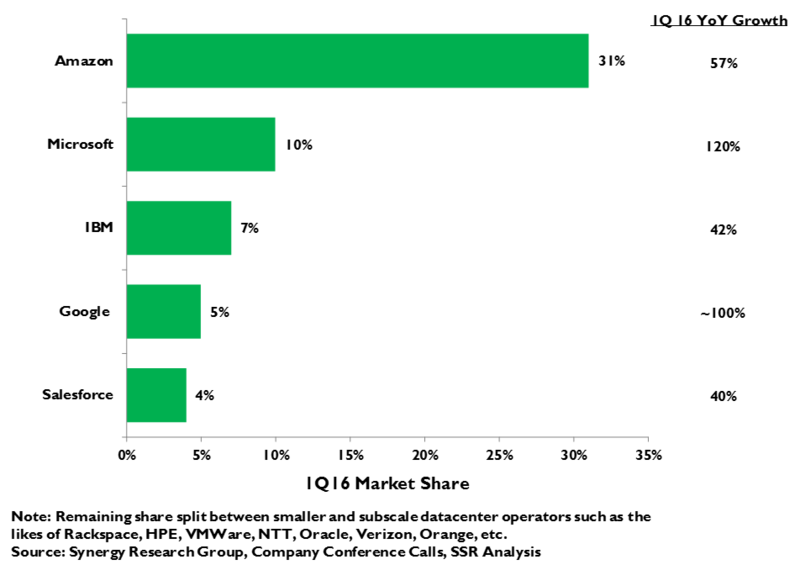 MSFT, ORCL and CRM lead SaaS shoppers. While MSFT has a substantial integration job ahead with LNKD, with more than $40B in net cash, we do not expect it to be shy in pursuing deals to buttress its aggressive cloud first strategy. We see process category leaders like NOW, WDAY, HUBS and ZEN to be particularly interesting. ORCL also has $40B+ in cash and is expected to be an aggressive SaaS shopper. It has already been active in vertical solutions, and would likely bid against MSFT for leading business process players. We also see ORCL as a fit for business intelligence tools companies. CRM has much less cash, but carries a growth multiple that should make it easier to swing all-stock deals. It has used previous deals to jumpstart entry into new areas – e.g. eCommerce vertical DWRE – and would expect it to focus on category leaders, and perhaps, on analytics. Security has its own possible buyers. Many old line IT companies have focused on data security as a key element in their quest for growth. CSCO, INTC and SYMC have acquired SaaS security companies, and almost certainly have appetite for more. IBM, Dell/EMC, HPE, and JNPR would also seem likely to be interested in high growth security stories, like CYBR, IMPV, or PFPT. AMZN and GOOGL are wildcards. IaaS platform players AMZN and GOOGL, competing with MSFT for enterprise hosting business, could make a strategic case for adding SaaS applications to the mix, levering their powerful and low cost infrastructure while adding sales presence with IT departments. Rumors suggest that AMZN and/or GOOGL have approached CRM about a possible combination, perhaps prompting CRM’s discussions with MSFT. Such a deal could resolve CRM’s dilemma as to its future data center and infrastructure software direction. Opportunities for financial buyers. 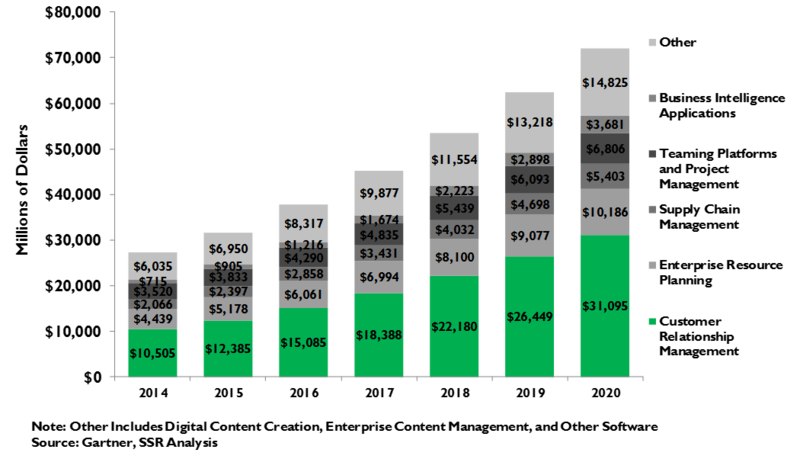 We believe that SaaS valuations still leave room for private equity deals. Companies, like RP, ININ, BSFT, SNCR, and ATHN, which show soft valuations relative to growth, with questionable expense and capital discipline could be targets. We recommend owning a basket of SaaS stocks. We have identified 40 stocks across all four categories that we believe are potential targets. Of these, we are particularly interested in business process players PEGA, NOW, WDAY, ULTI, HUBS and ZEN, BI analytics names NEWR and SPLK, vertical solutions vendors VEEV, RP, QTWO, and SHOP, and security providers CYBER, PFPT, and IMPV. Of these, NOW, and WDAY are in our large cap model portfolio. Year to date, 12 public SaaS companies have been acquired at an average premium of 53.3%, vs. 6 acquired in all of 2015. Certainly, a massive hit to SaaS valuations, precipitated by the February 5th disappointments posted by both DATA and LNKD, created an opportunity, but the biggest deals – MSFT’s $26B LNKD buy, ORCL’s $9.3B N pick up, and CRM’s $2.8B acquisition of DWRE were all for prices at significant premiums to pre-dip levels. Amongst the four companies taken private, only QLIC sold for a discount to its January valuation. In this context, we see the deal making as more than simple opportunism. We believe small SaaS companies are coming to a crossroads, where their ability to sustain growth will be compromised by their sales reach and their cost competitiveness will be threatened by the huge advantages of hyperscale data center operators. This is prompting a consolidation, big eating small to fill gaps in their suite of enterprise software solutions and to fuel growth. Abundant synergies – in infrastructure, in sales, and in combining products – are more than sufficient to drive premiums for targets with accretion for buyers. We sorted the 40 US traded enterprise SaaS names with market cap above $1B into 3 categories based on their products: 1. Business process solutions – e.g. CRM, HR, customer service, etc. ; 2. 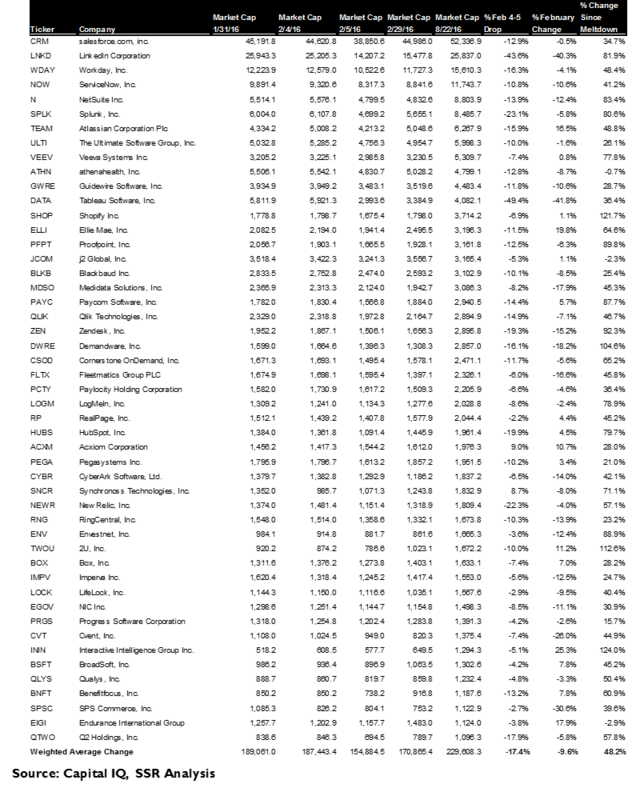 Vertical solutions – e.g. health care, insurance, retail, etc. ; 3. Tools – specialized functions, like security and business intelligence analytics that can be applied across business processes. Likely buyers will shop for the categories that suit their particular needs. We expect MSFT to be tightly focused on best of breed business process solutions that can be integrated into its vision of a comprehensive system of AI-fueled applications able to give management unique insight into the workflows and productivity of their organizations. The LNKD deal followed this philosophy, and we would see companies like NOW, WDAY, HUBS or ZEN fitting into this model. ORCL seems to be chasing growth from targets with both vertical and horizontal business models. OPWR and TXTR offer cloud solutions tailored for the utility and construction industries respectively, while N sells a broad suite of SaaS ERP functionality. While these deals move ORCL closer to its goal of $10B in cloud sales, it is less clear that it can derive much in operating synergies. Still, history suggests ORCL, with its $40B in net cash, will be aggressive in buying new revenues. CRM, which picked up eCommerce vertical DWRE and was rumored to be an aggressive runner-up for LNKD. We would expect it to pursue the same roster of business process leaders as MSFT and suspect it has interest in the analytics category as well. Other companies will be shopping as well. IBM, SAP, HPQ, and Dell/EMC lead the contingent of traditional IT suppliers looking to SaaS as a way out of their decline. IBM joins SYMC, INTC, JNPR in the list likely to look at cloud-based security players. GOOGL and AMZN rate special notice as two of just 3 scale players in cloud infrastructure – both are rumored to have shown interest in CRM around the time of its flirtation with MSFT, and could retain interest in broader business process plays that might jumpstart a more serious move into enterprise competition. Finally, we do not think private equity is done with the sector, and see lower multiple but growth names with potential for operating improvement. We believe TMT investors should consider a basket of high quality SaaS names both for their immediate growth prospects and for the potential of acquisition. We hold WDAY and NOW in our model portfolio, and would also recommend PEGA, ULTI, HUBS, ZEN, BI analytics names NEWR and SPLK, vertical solutions vendors VEEV, RP, QTWO, and SHOP, and security providers CYBER, PFPT, and IMPV. There are huge scale economies in the cloud. This is abundantly apparent in the IaaS hosting market, where behemoths Amazon Web Services, Microsoft Azure and Google Cloud Platform are outgrowing the field, with service offerings and pricing that smaller rivals cannot match. AWS is already wildly profitable and Azure seems to be headed in that direction. Number 3 Google is trying to play a bit of catch up against its two fast growing competitors, and has hired legendary Silicon Valley guru Diane Greene to energize its pursuit. With advantages accruing from design sophistication, capacity utilization, operating cost leverage and scale buying power, we believe that the big three enjoy a nearly 10 to 1 computing cost lead vs. privately owned data centers (Exhibit 1). 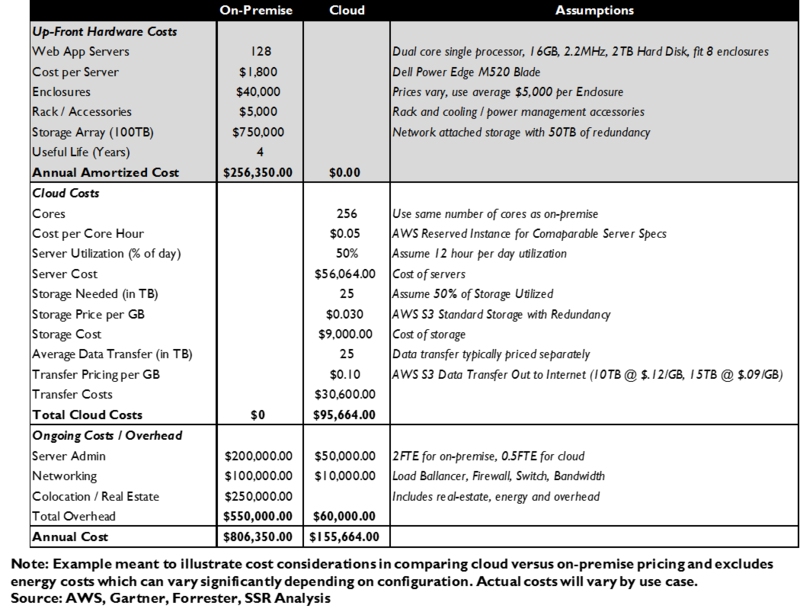 These platform cost differences are important to consider for SaaS applications as well. While the functionality of the application itself is the primary selling point, the data center infrastructure that comes bundled with the app is an important driver of costs and performance. While most SaaS players enjoy platform cost advantage vs. traditional packaged software running on privately owned data centers, their bundled infrastructure is no match for that of bigger players. Add in the costs of a salesforce positioning a long sales cycle product to a global market of IT professionals as the low hanging fruit comes off of the tree, and smaller SaaS companies face a battle to maintain their established growth trajectories in the longer term. We believe that even the larger SaaS players could face future pressures as the size and sophistication of their data center operations, while obviously ahead of most competitors, are still well behind that of the big three IaaS hosts. In our view, this includes Salesforce, Oracle, SAP and even IBM. In this environment, there are unusually large synergies available to would-be acquirers. A standalone SaaS application added to a larger platform will typically run at lower costs and fed to a larger and better positioned salesforce will generally find a broader customer base (Exhibit 2). Moreover, adding a new app to a broader mix may add value to the whole – filling a functional gap, enabling the penetration of a vertical market or bringing capabilities that can be introduced to existing products. An acquirer can also add value to the products it buys, levering assets deep learning technology or mobile platform expertise. Given our belief that the large majority of enterprise computing will migrate to the cloud over the next 10-15 years, and that applications offered as a service will be the primary vehicle driving that exodus, the imperative for traditional software vendors to build breadth and advantage in the cloud is considerable. On February 5, 2016, LinkedIn and Tableau Software issued disappointing 4Q reports to investors within an hour of each other. The two stocks both traded off by more than 43% afterhours, and precipitated a rout in the SaaS subsector when trading opened the next day. Of 40 SaaS stocks with a market cap greater than $1B, the weighted average decline for February was -9.6%, despite strong results from sector leaders Salesforce and Workday toward the end of the month (Exhibit 3). Since then, most of the group has recovered to near their 52-week highs, but given an average of 32.9% sales growth over the past year, sales multiples remain well below historical levels. This has been an obvious contributor to the pickup in M&A activity – year to date, a dozen public SaaS companies have been bought, already double the number of deals that had been done in all of 2015 with four months left to go (Exhibit 4). 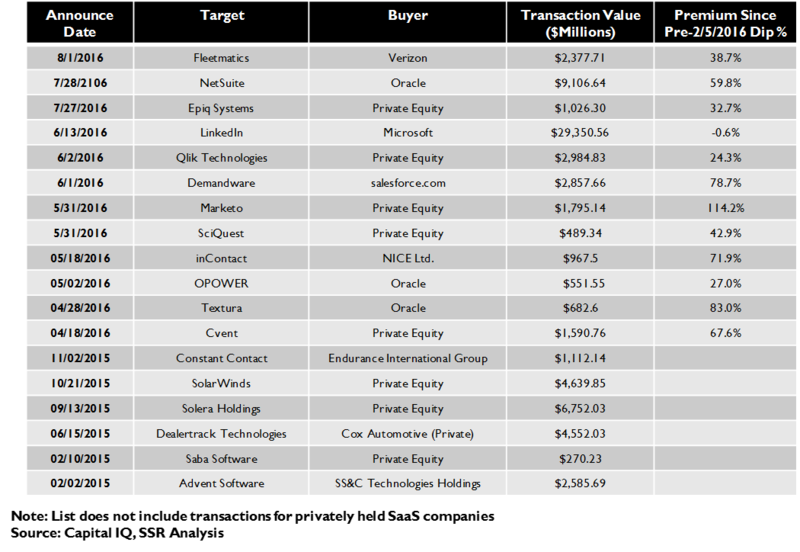 Still, we note that most of the deals, including Microsoft’s $26B LinkedIn buy and Oracle’s very recent $9.2B NetSuite deal, were done at premiums to pre-swoon valuations, confirming their strategic impetus. We expect the strategic deal making to continue despite the recovery. Financial players may find value in the SaaS market as well. We note that Bain Capital, which had bought SaaS security solutions player Blue Coat Systems for $2.4B in March 2015 was able to sell it to Symantec for $4.65B in July. With excellent prospects for successful exit, we believe private equity firms will continue to sift through laggard SaaS application companies looking for opportunities to add value through firm expense discipline. 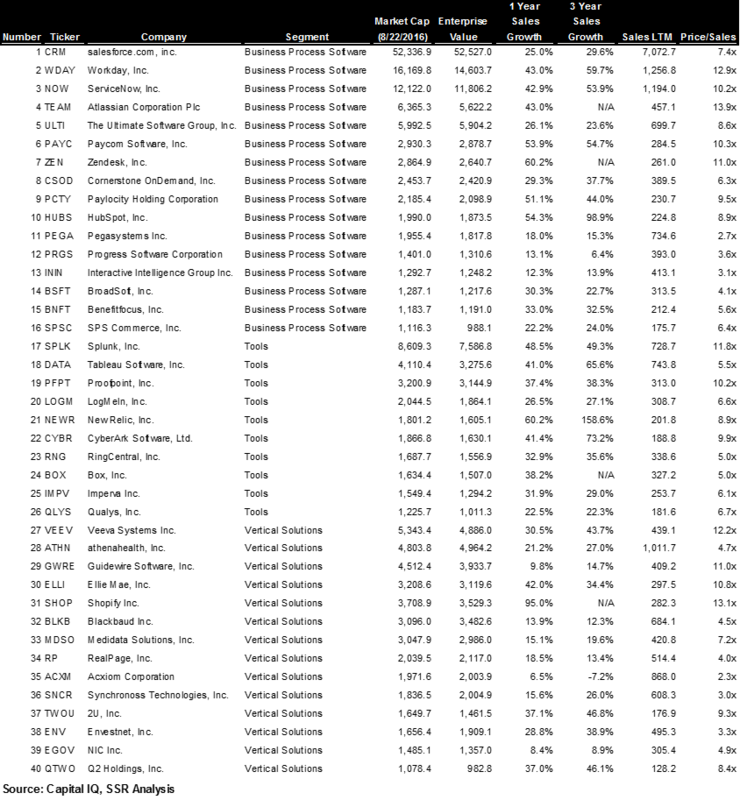 We have identified a universe of 40 publicly traded SaaS companies, each with a market cap exceeding $1B (Exhibit 5). These companies roughly fall into three categories. Business Process Solutions – systems that address the functional needs of a particular department in an organization, such as customer relationship systems (CRM), HR, finance, or customer service – is the largest category, accounting for 16 of the 40 companies. Much of this software falls under the rubric of “Enterprise Resource Planning” or ERP, a comprehensive set of business process solutions offered as an integrated whole. ERP has been the calling card for SAP, which established its dominance in the category in the rush to upgrade software ahead of the prophesized Y2K apocalypse. Would be competitors, like Oracle, IBM and Microsoft have chipped away at SAP’s lead, primarily by attacking parts of the comprehensive ERP suite with best-of-breed solutions for a particular business process. SaaS is a huge opportunity to upend the ERP market (Exhibit 6). Salesforce has already established dominance in CRM with its cloud-delivered flagship product. Companies like Workday (HR), ServiceNow (customer service), and Atlassian (project management) have followed a similar tack, addressing specific functional areas with best-of-breed solutions. Others, like the recent Oracle acquisition NetSuite, have looked to offer an SAP-like integrated ERP product, often targeting the small and medium business (SMB) market, which typically lack the resources and sophistication to run a packaged ERP solution in their modest data centers. Given the ongoing disruption generated by the companies in this category, we expect traditional software rivals – e.g. Microsoft, Oracle, SAP, IBM, Hewlett Packard Enteprise, Dell EMC, and others – to be active shoppers to fill holes in their own portfolios, to gain best-of-breed solutions, to reap the benefits of synergies, and to block potential competitors. The second category, comprising 14 companies on the list, is Vertical Solutions, software tailored to the needs of a particular target industry, such as health care (Athena Health), insurance (Guidewire), e-commerce (Shopify), mortgage banking (Ellie Mae), and others. Oracle, which acquired SaaS vertical solutions for utilities (Opower) and construction (Textura) earlier this year and has historically been active in buying industry focused software is believed to have further interest. IBM, which has shown strong interest in the life sciences/health care vertical, could also be a player. The smallest category, with just 10 of the 40, is Tools. These companies provide specific software-based functions that can be used across multiple business areas and in many industries. The two biggest subcategories are Business Intelligence (BI) analytics and Security. In the BI group are companies like Splunk, Tableau Software, and New Relic, offering software solutions to manage and analyze “big data”. Security is self-explanatory, including names like Cyberark, Imperva and ProofPoint. Other tools include areas like file storage (Box), remote collaboration (LogMeIn), messaging services (RingCentral) and others. Interest in these arenas is likely to come from companies with pre-existing positions looking to gain specific best-of-breed functionality. Microsoft, Oracle, SAP and IBM all compete in BI today, while companies like Cisco, Symantec, IBM, Juniper, Intel, and others could be shoppers for the security subcategory. Microsoft’s $26B purchase of LinkedIn, reportedly won in competitive bidding with Salesforce, is an illustration of its enterprise application strategy. LinkedIn’s human resources software is a best-of-breed business process solution that will fit nicely with Microsoft’s Dynamics ERP product suite. Moreover, Microsoft can use the demographic and usage data from the professional network aspect of LinkedIn’s business, combined with its very strong deep learning AI capabilities, to give its CRM solution a unique advantage. Microsoft can also generate operating synergies by porting LinkedIn to its Azure IaaS platform and levering its extensive sales organization to introduce LinkedIn’s products to a broader enterprise audience. We would expect future Microsoft acquisitions to focus on adding other best-of-breed business process functions to its horizontal application suite – for example, adding a customer service or project management element. As the leader in productivity tools, it is also possible that Microsoft will look to add further business intelligence and collaboration capabilities to its palette. Oracle’s long history of acquisitions has largely been a quest for growth, establishing an expertise in bolting on new software products and exploiting its large, aggressive sales organization (Exhibit 7). Its approach in SaaS appears to follow in stride, particularly given the stagnation in the company’s traditional packaged software business. Look for Oracle to remain aggressive in pursuing targets with well-established growth where it can lever its sales muscle. These targets could be either business processes or vertical solutions – it has shown appetite for both. Salesforce’s big deal this year was DemandWare, a vertical solution for e-commerce sites. Given Salesforce’s focus on marketing in general, this was a relatively natural extension and, perhaps, an indicator of interest in other marketing oriented business process elements, such as customer service or marketing communications. A bigger strategic leap would be to add business intelligence tools, a move perhaps more likely as competition with Microsoft intensifies. We also note that Salesforce is strongly believed to have shopped itself to Microsoft and, perhaps, Amazon and Google in 2015, a reflection of its own concern for those companies’ scale advantages. SAP has been very active in rolling up business process companies the past, having spent $3.4B on SaaS HR company Success Factors in 2011, $4.3B on SaaS supply chain software company Ariba in 2012, and $8.3B on expense reporting platform Concur in 2014. It would not be surprising to see SAP shopping for further best-of-breed business process solutions, or, for that matter, BI analytics tools. IBM also makes sense, particularly with vertical solutions providers in arenas like health care, life sciences, and financials, where it can lever its own strong industry connections and growing AI expertise. The other usual enterprise software suspects – Hewlett Packard Enterprise, Dell EMC, etc. – can also be expected to kick the tires on SaaS application names. Cisco, Juniper, IBM, Symantec and others are likely to shop for SaaS security technology. Amazon and Google are the two wildcards. Both have world-class cloud platforms, ambitions for the enterprise market and enormous financial resources. We believe that both companies may have approached Salesforce about the potential for a friendly deal, a move that could have moved either into a strong position to challenge Microsoft for leadership in moving traditional enterprises into the cloud era. Amazon, which is far ahead of the field in pure IaaS hosting, has been aggressive in building a sales force to call on traditional enterprises and has won several high profile hosting deals with large companies. Google has been slow to build enterprise momentum, but has hired VMWare founder and Silicon Valley legend Diane Greene to build the business. She has already been aggressive in hiring industry veterans and can lever the Google Docs productivity suite, market leading analytics tools, and best-in-class AI capabilities to gain traction. Either company could choose to layer on SaaS applications through acquisition. Finally, private equity could still get involved, particularly for companies still trading at substantial discount vs. history and relative to their growth trajectory. Cheap SaaS stocks with opportunities to make improvements in operating expense and capital discipline are likely still enticing to financial buyers with the ready exit of selling to a strategic buyer if efficiency improvements take hold. It’s difficult to predict exactly which companies will be acquired and at what price, but we are confident that the deals will continue with strong potential for investors to profit. We advise owning a cross-section of SaaS stocks. Of the universe of 40 names with greater than $1B market caps, we believe that the 16 business process solutions companies will have the most potential suitors. We currently have both Service Now and Workday in our model portfolio, and see Zendesk, HubSpot, Cornerstone OnDemand, and Pega Systems as likely to draw interest. Vertical Solutions may have a shorter list of potential shoppers, but there is still strong interest. We are particularly intrigued by the health care and life sciences names – Athena Health, Medidata and Veeva Systems. Within the tools segment, we see the BI plays (Splunk, Tableau and New Relic) and differentiated security firms (CyberArk, ProofPoint and Imperva) as being the most likely candidates for M&A.